In the title compound, [Cu(CN)(C4H5N3)](n) or [Cu(mu-CN)(mu-PyzNH(2))](n) (PyzNH(2) is 2-aminopyrazine), the Cu-I center is tetrahedrally coordinated by two cyanide and two PyzNH(2) ligands. The Cu-I-cyano links give rise to [Cu-CN](infinity) chains running along the c axis, which are bridged by bidentate PyzNH(2) ligands. 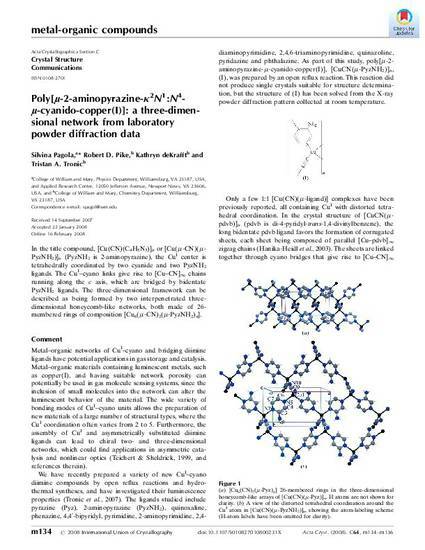 The three-dimensional framework can be described as being formed by two interpenetrated three-dimensional honeycomb-like networks, both made of 26-membered rings of composition [Cu-6(mu-CN)(2)(mu-PyzNH(2))(4)].